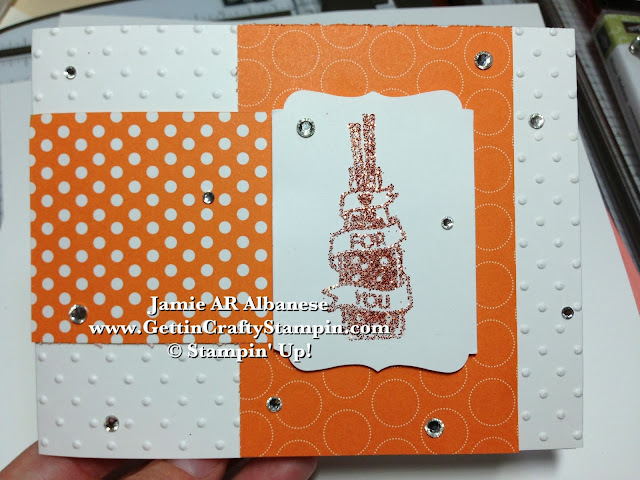 Getting Crafty with Jamie: Sparkles and Bubbles, Oh My! Sparkles and Bubbles, Oh My! Soda, Pop, Bubble, Sparkle... Drinking Soda (or Pop, depending on where you live - a nod to my family in Indiana, lol) as a kid I'd sip it fast as it tickled my nose... this vintage, bubbling, sparkle card is sure to sweeten someone's day! It's calorie-free (yay!) and won't go bad - living a long time on your counter or fridge, continually adding sparkle and shine to your days!! What do you think? Does is add sparkle and sweeten your day?? Leave me a comment and let me know! Please Share this (and Me), Pin, Email, Facebook, Tweet, Google+, and more! Join me on these avenues with Following Me (on YouTube, Instagram, LinkedIn, Foursquare and more!). Flavored Pops were my Daddy's favorite.. he loved Grape and Orange soda (they were too sweet for my tastes, I prefer Sprite or Sassafras/Root Beer). So when this Cycle Celebration stamp set (#130273) came to live with me... and the new Black and Orange Stampin' Glitter (#132206 Holiday Catalog pg. 20) made raise a toast to the old man and smile as I'm sure he's drinking an old fashioned fruit flavored soda and smiling down on us. Punching this image was my plan... until I realized that I'd have to cut the image (ugh) so, instead, I fed the ends into this Decorative Label punch (#120907) for fancy edges without cutting off the image! 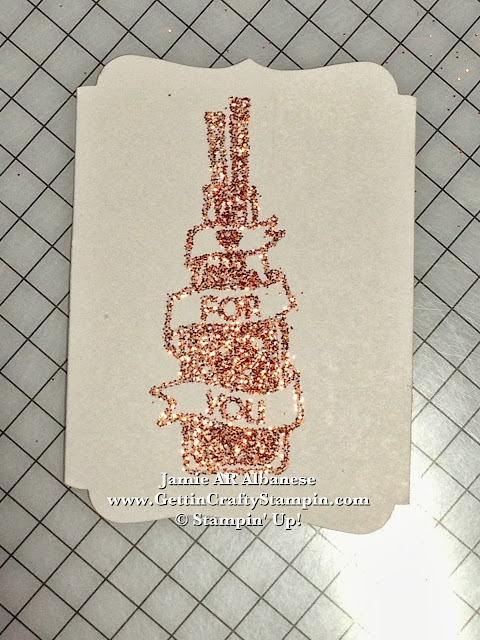 Create a fun Sparkle Stamped image that is oh-so sweet! 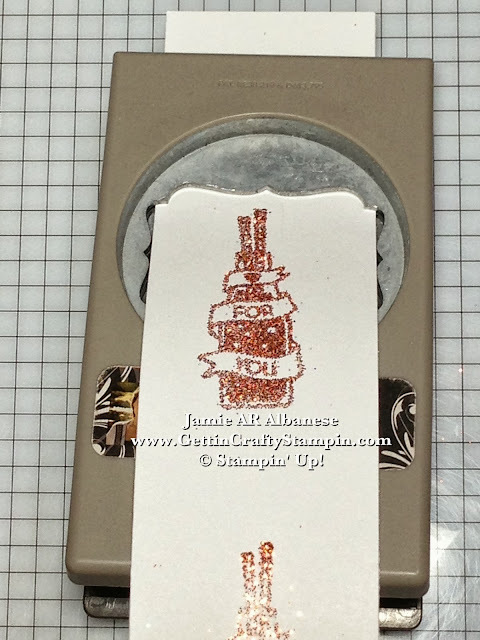 Stamp the soda-pop image with Versa Mark ink (#102283) and cover with Heat & Stick Powder (#100625) and after heating with the Heat Tool (#129053) cover with the Orange Stampin' Glitter and heat set again. Easy and sure to WOW when someone receives this sparkling card! 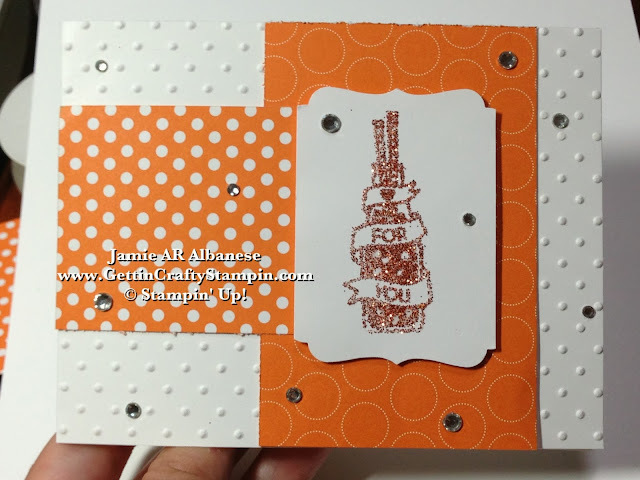 Picking up on the bubbles in this stamp, using the Big Shot Die-Cutting machine (#113439) and Perfect Polka Dot embossing folder (#117335) on this Whisper White card stock (#100730) for a bubbled effect. Incorporating both sides of this Pumpkin Pie sheet of Polka Dot Parade (#126902) for two versions of fun 'bubbles'. Adding randomly placed adhesive backed Rhinestone Basic Jewels (#119246) for 3D Sparkle Bubbles. Small continued accents that tie in a theme is a great way to have a fun, funky and cohesive look. It's so appealing to the eye (like eye-candy!). Calorie-Free FUN! Vintage, Clean, Elegance that Sparkles and Shines! No matter what you call it, whether you drink it or not, soda-pop of old is sure to bring sweet new memories or memories of old. I hope that this fizzy inspired card POPS into Your Day to Sweeten it!! Have a Sparkling day - on me! Thanks for coming by - I post daily and hope to see you often!